My creation tonight while waiting up for #1 son's arrival home. He's been helping with the South Nebraska Shrine Bowl team all week, and the game was tonight. This is his 3rd or 4th year of helping and it's a great experience for him! He's in need of some rest though after a busy week!! Here is my creation, using a new to me stamp set, Flower Fancy. I've always liked it but didn't own it until recently! I waited to redeem my SAB earned sets until the retirement list came out and this one made the cut!!! 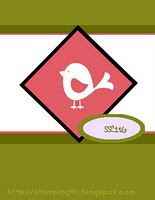 Card base is the new Daffodil Delight. Background is a piece of Whisper White layered under Old Olive top and bottom pieces that went through the Big Shot with the Perfect Polka Dots folder. The Whisper White in the center was stamped with the small flower and leaf. 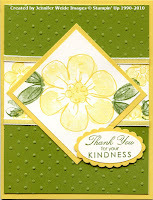 To get the lighter image I stamped off the Daffodil Delight once before stamping onto the cardstock. The edge of the Whisper White/Old Olive is lined with the new Daffodil Delight 1/8" Taffeta Ribbon. The main image is the large flower, again stamped off once for the solid image. Saying from the hostess set Occasional Quotes punched with the large & scallop ovals. 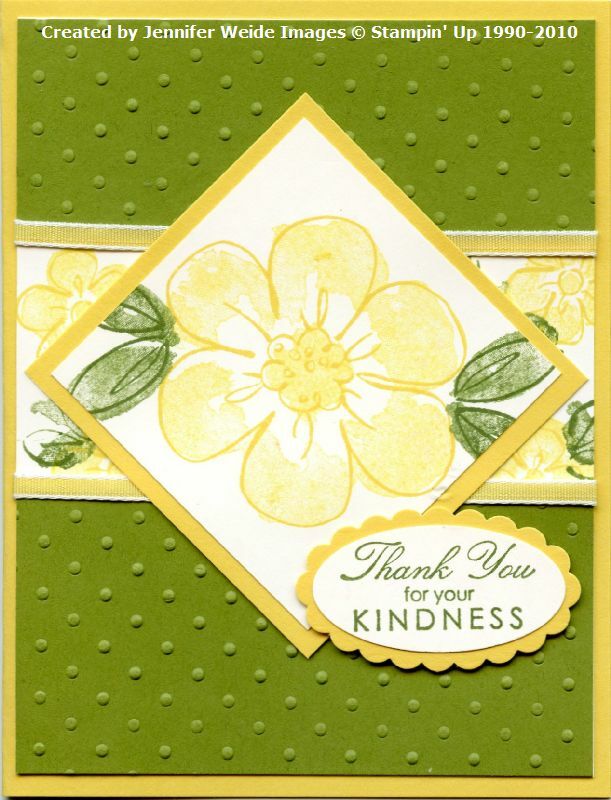 Beautiful color combo, and I love the way you've used the thin ribbon along the edges! Absolutely stunning color, great design! Oh...love the new color you used! Great job with the Stamping 411 sketch this week!